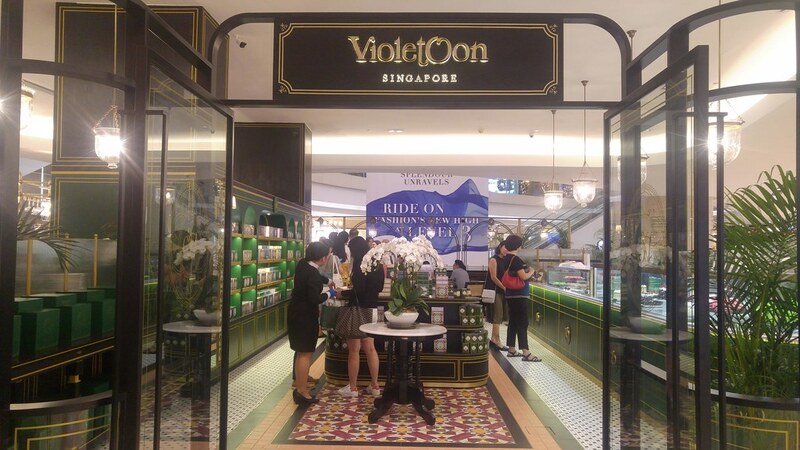 Violet Oon Singapore at Ion Orchard is the brand’s fourth and largest outlet, an all-day dining brasserie that combines both dining and retail. 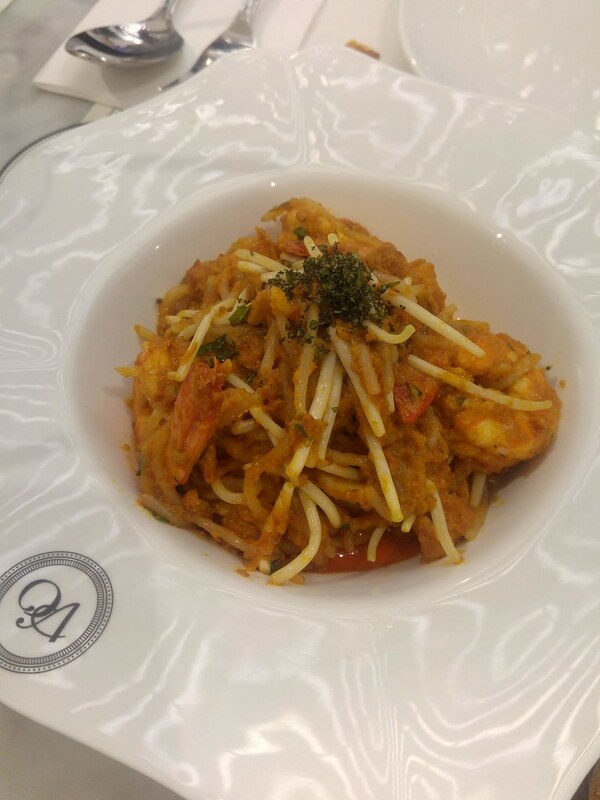 Serving up VO’s signature recipes of local favourites and Nyonya classics, the menu also curates a selection of British dishes as seen through the eyes of the early Hainanese chefs of Singapore. In addition, a new range of celebration cakes can be enjoyed at the restaurant or order for takeaways. 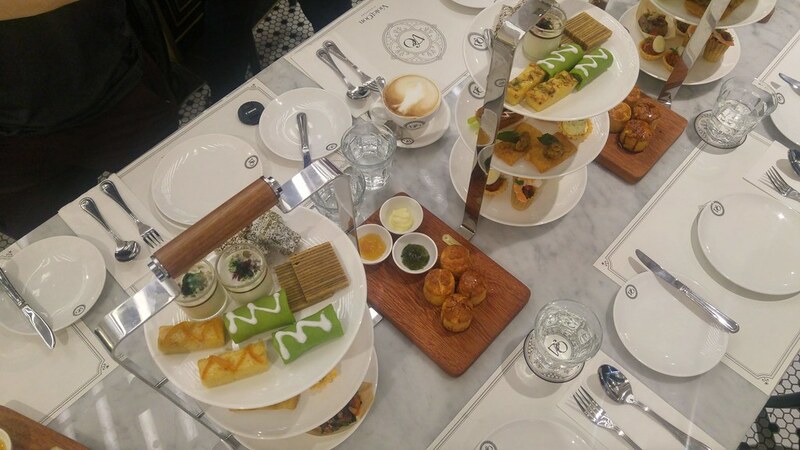 There is also a retail collection of pastries, including our all-time favourite kaya, all dressed in retro-modern fit, all ready to be shown on the global runway. Other than mains and pastries, I could see that most were here at for the Singapore High Tea Set ($58 serves 2) which offers an array of local favorites and Nyonya signatures in petite sizes, with notable items such as Yam Cake, Kuey Pie Tie and Chilli Crab Tart, alongside with classic English High Tea bites. 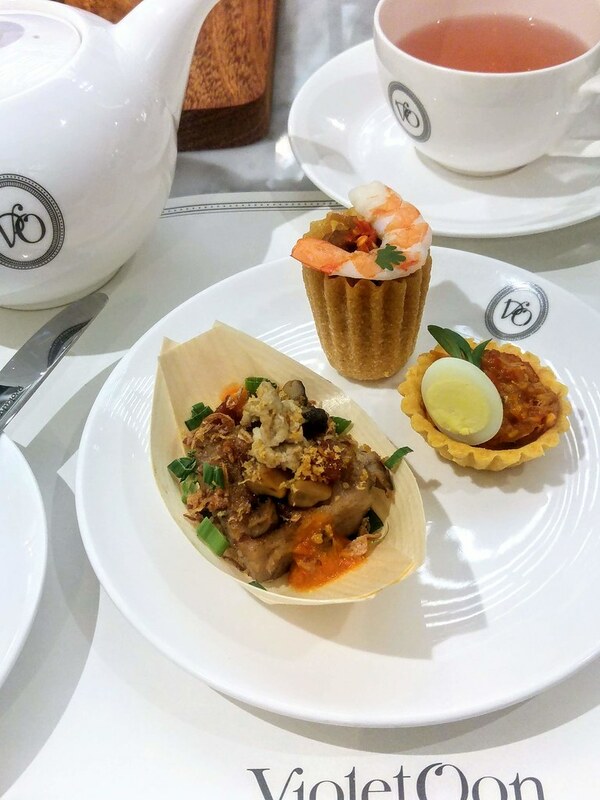 Both Kuey Pie Tee and Chilli Crab Tart were very much on the sweeter side, while the Yam Cake in comparison was more balance in taste, a boat loaded with umami ingredients such as mushrooms, fried shallot and chilli. On the top tier are all your sweets. The Bubur Cha Cha Panna Cotta was decadent with a smooth and velvety coconut based panna cotta. The Financiers, a traditional Eurasian Cake of semolina and ground almonds, are also worth your calories. If only the Kueh Kosui could be that good a feel in the mouth. I guess when comes to kuehs, it has to be freshly made, like the warm and soft Kueh Kosui from Maxwell Food market. 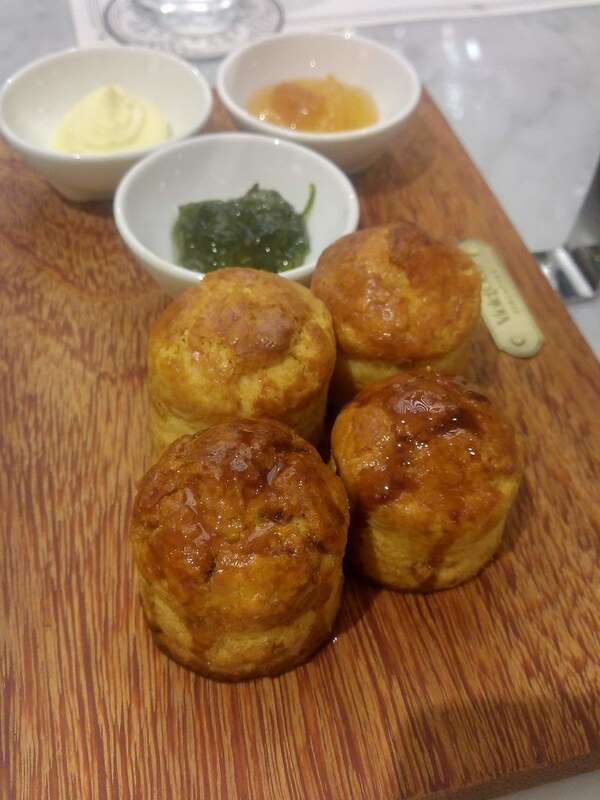 The Scones comes with gula melaka drizzle on them, and what is unique about theirs is the slightly tart Calamasi jam that complement the gula melaka scone. I was rather amused that there is no lack of gula melaka items here, most sweets are laced with it one way or another. Moving on to their signature mains, Salmon with Kale Kerabu ($26) is a great start to any meal, given its tangy sauce and crisp baby kale. 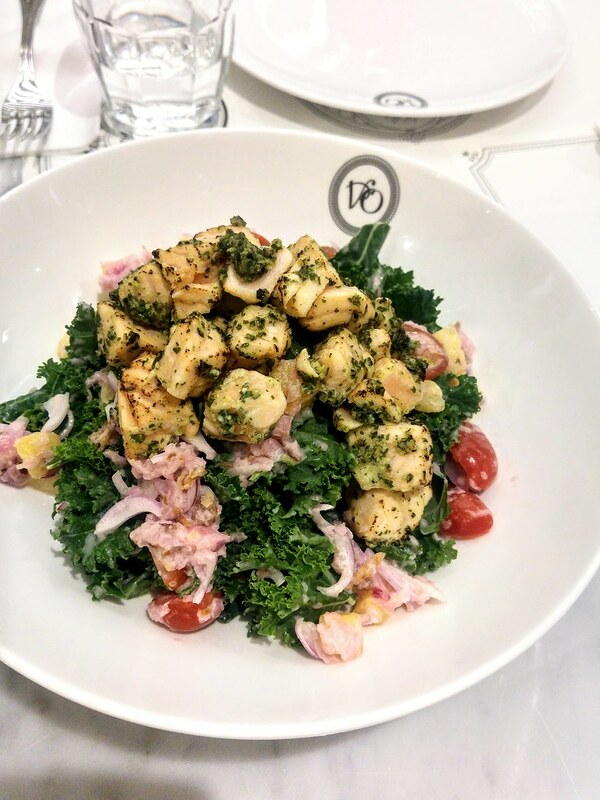 The salad dressing is made of sambal belachan and coconut cream, sounds creamy but not at all as it only coat the kale lightly. The salmon cubes were flamed grilled, lending a layer of smokiness to the salad. The acidity from the pineapple cubes brightened up the dish even more. 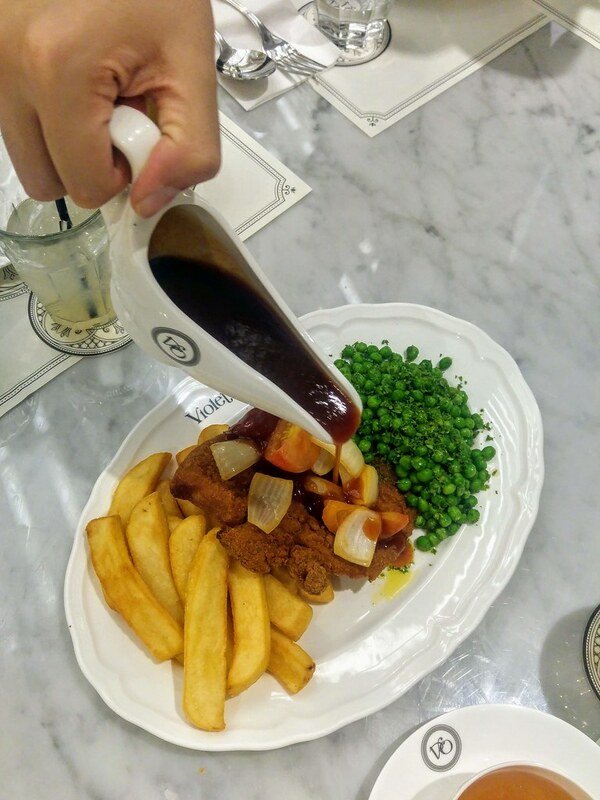 Among all the dishes we tried, I would say the Hainanese Pork Chop ($34) is the most successfully elevated dish, from a staple dished out from a British Hainanese kitchen to one to be served with that price tag. Using Kurobuta pork loin, it was deep fried with a cream cracker batter. The crust reached an ideal crisp with the inside still moist and juicy. A hefty piece of pork chop but the sweet and tangy housemade tomato reduction helped to cut the richness of the meat. 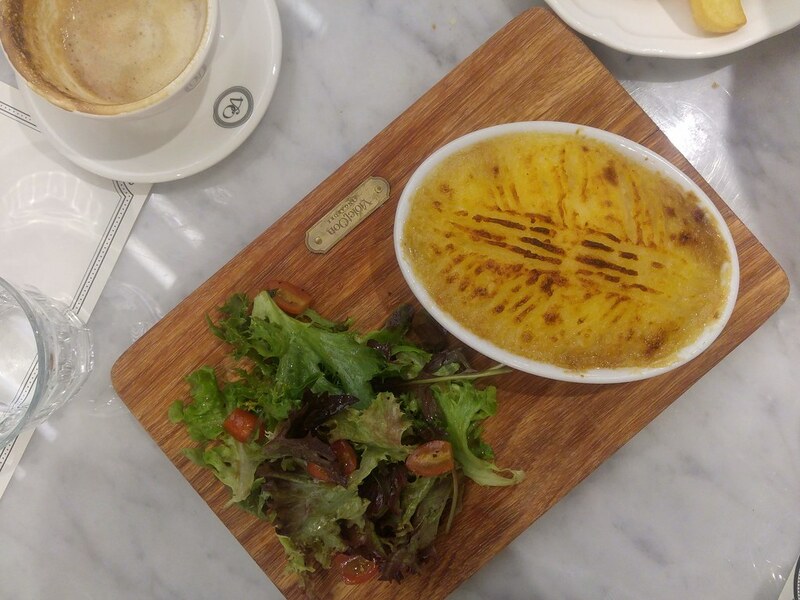 VO’s Shepherd’s Pie with House Salad ($24) was one of the better ones that I have tried. At least the creamy mashed potato stayed dry and creamy atop the slow-braised mince beef, while others tend to sink in like quick sand the moment I dug my spoon into it. The top could be more baked. 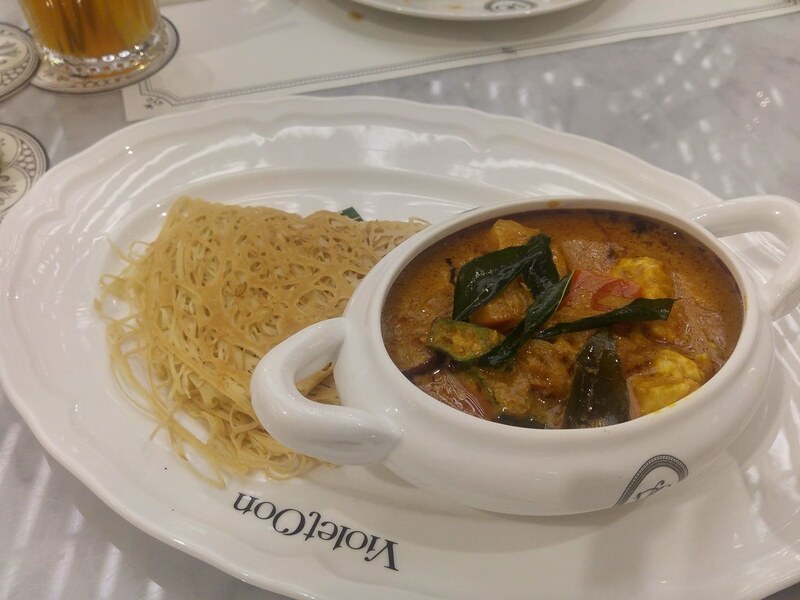 Fish Curry with Roti Jala ($29) is a dainty version of our czechar fish head curry cooked using red snapper. Nonetheless, the curry was on point. It is robust, rich and edged with a slight tang, making it a good match with the slightly sweet traditional laced pancake. The Dry Laksa ($24) is a crowd pleaser. Fresh rice noodle is tossed in Violet's laksa gravy and loaded with beansprouts and tau pok, it was like a scrumptious laksa salad. Just imagine a reduction of a fiery Laksa gravy, with all the goodness concentrated into one small plate. Well cooked succulent prawns could have brought the dish up another notch but ours were a tad too dried up for my liking. Love our local flavours but not the starchy Kueh itself? 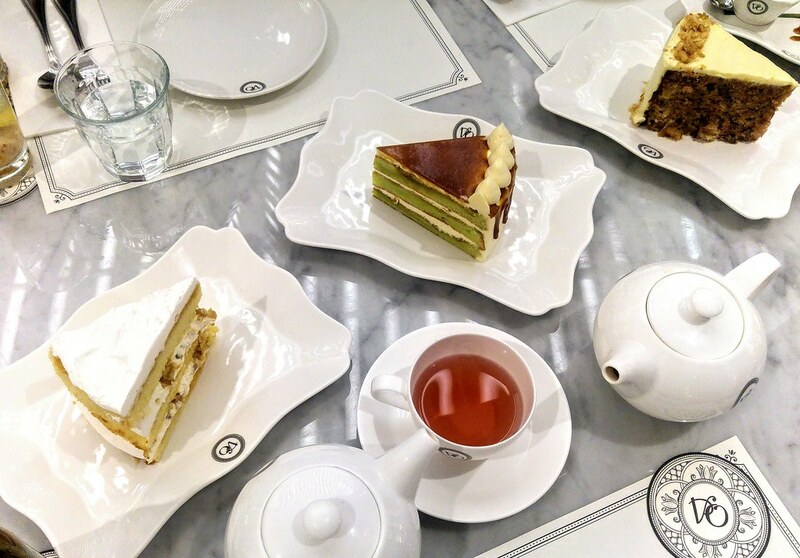 You will find your perfect combination in the range of cakes offered at Violet Oon. 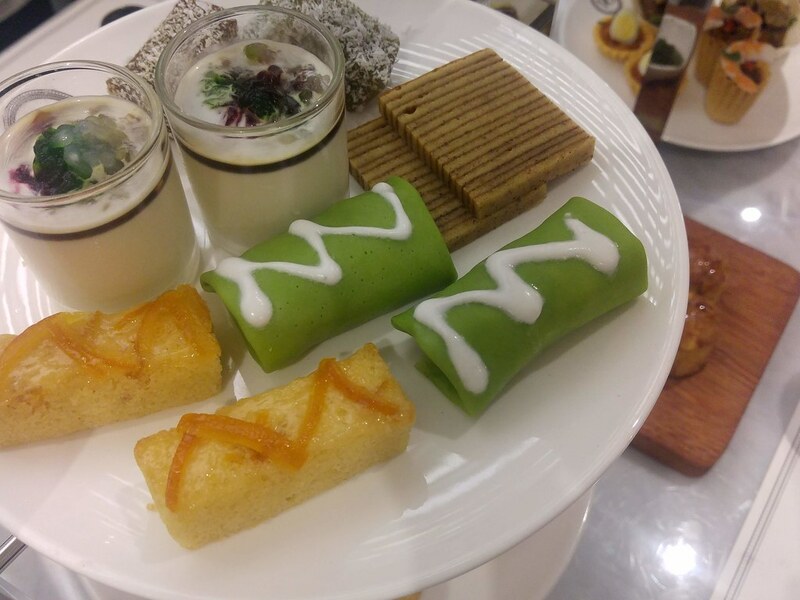 Pandan Gula Melaka Cake ($43/6" or $75/9”) is a rich sponge cake made with freshly squeezed pandan juice, with layers of buttercream frosting and desiccated coconut tossed in a gula melaka syrup. It is rather sweet, hence I very much prefer the Pineapple Gula Melaka Cake ($46/6” or $80/9”). The cake was fluffier and the buttercream, punctuated with sweet and tangy pineapple chunks, made it even more luscious rather than weighing it down. As for the VO’s Carrot Cake ($52/6” or $85/9”), other than its sweetness, it is one of the few that are loaded with real chunky ingredients, layered with a bright calamansi-infused cream cheese frosting. Indeed, heritage flavours and taste are hard to master. The mains at Violet Oon fare much better, alongside with some of their cakes and pastries. But these days, it is all about the looks. 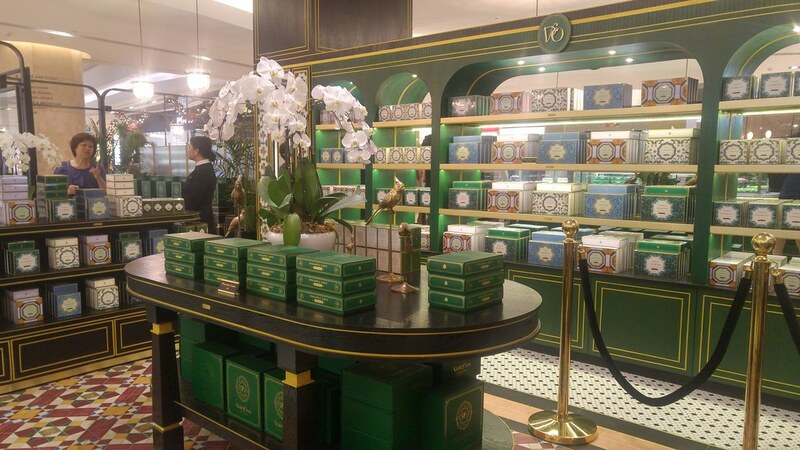 What stood out the most not the food but the retail section that boxed Singapore's flavours into pretty Peranakan 'tiles'. Great gifting ideas for the Christmas!